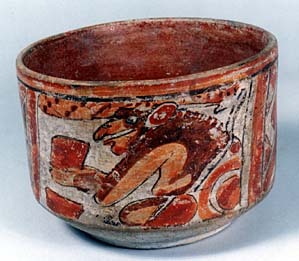 Highly decorated ceremonial vessel on low ring base, the pictorial field decorated with two seated chiefs holding bowls, the panels separated by slanted columns with geometric design; painted in bright shades of red-orange and black on a white-cream ground, the interior a reddish brown. 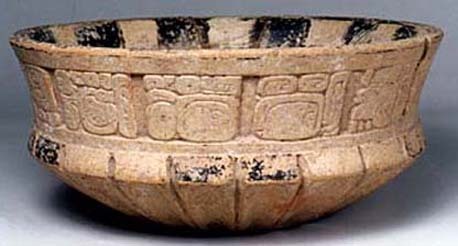 H: 4" x D: 5-1/2"
A cream colored fluted bowl with band of carved hieroglyphics encircling the flared rim of vessel and a row of ribbed flutes circumscribing the lower margin of the bowl. Interior rim painted in black checkerboard design. Traces of black paint on exterior lower rim. 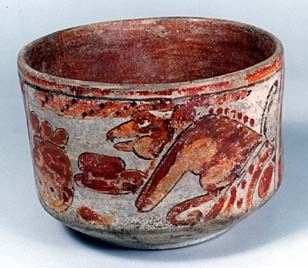 The deeply carved band of images on this Mayan epigraphic bowl in the Chochola style is a written text. Although not completely deciphered, a preliminary reading is possible. 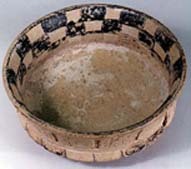 A summation of the inscription is : It happened, it was blessed, it was carved, [and] polished, his drinking vessel [this part of the text refers to the creation and sanctification of the bowl]. 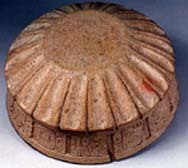 The inscription continues with the name: Cholom, who was the artist or owner, and his lordly title: sa hal. The text ends with the name of the locale where Cholom lived: Sak Te Nal, or The White Tree Place. H: 3-1/2" x D: 8"